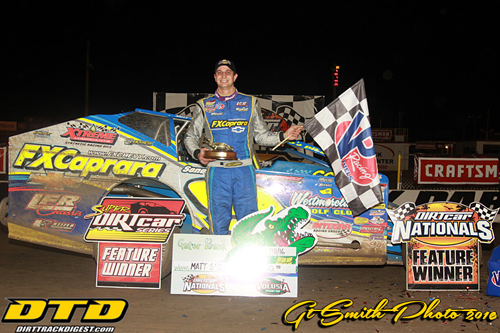 BARBERVILLE, FL – Thursday night’s 30-lap Modified DIRTcar Nationals main-event at Volusia Speedway Park came down to a battle between two of the best Super DIRTcar Series drivers in the Northeast. Matt Sheppard and Larry Wight duked it out for the final 10 laps of the feature race with Sheppard coming out on top at the checkered flag. Sheppard’s win came behind the wheel of his self-owned No. 9s Bicknell. The Waterloo, N.Y., driver split with Heinke-Baldwin Racing over the winter after a successful 2015 that saw him win the series title. This forced Sheppard to go in a different direction this year. Sheppard chose to start his own team and it quickly paid dividends as he marched to his seventh career DIRTcar Nationals triumph. Wight redrew the pole and was flanked for the start by opening night winner Tim Fuller. Wight surged to the lead at the start before caution slowed the pace after only one lap. Billy VanInwegen caught the inner guardrail and shot up the bank collecting several cars in turns three and four. Everyone was able to continue except VanInwegen as his night came to an end with front end damage. The field restarted with Wight at the point but he quickly lost two positions as both Labauch and Fuller shot by in turns one and two. Laubach raced to the lead with Fuller looking to his outside as they battled down the backstretch. Laubach would come out on top as the race leader. Laubach set a torrid pace from this point as Fuller did everything in his power to remain in the thick of things at the front of the field. Laubach continued to distance himself with Fuller searching around as the high-line that propelled him to victory wasn’t as strong as it was on Wednesday night. Action began picking up as the race reached the halfway point. Laubach caught the tail of the field which impeded his progress as he had to work through traffic. The rest of the field took advantage and closed the gap. Laubach led with Fuller second while Wight and Sheppard swapped the third position lap after lap. With just eight circuits left, Sheppard and Wight pounced on Laubach and Fuller. Fuller faded while Laubach got boxed in by a slower car on the bottom allowing Sheppard to roll the middle and Wight to use the extreme outside. The three drivers waged a fierce battle for the lead until Sheppard finally edged in front on lap 24. Even though Sheppard was able to wrestle the lead from Laubach he still had to hold off Wight. Wight began slamming the cushion in his LJL Racing Teo Pro Car. This allowed him to stay within striking distance of Sheppard. Sheppard altered his line just slightly to find the bite off of turn two. This alteration provided him the opportunity to gain some breathing room as he worked through traffic quickly. Sheppard scored the win over Wight by 1.2 seconds. Wight wheeled his No. 99L around the cushion but it wasn’t enough to pull off the upset victory in the closing laps. Wight was hoping to add a Small Gator trophy to the Big Gator trophy he won at the conclusion of 2015. A second DIRTcar Nationals title is a possibility now that he has two top five finishes on the week. He’ll continue to search for a win in the final two nights of competition. Laubach, a Modified standout in his own right from Hellertown, Pa., was able to hang on to the final spot on the podium. He was disappointed with how the race played out. He said he felt like the slower car may have cost him an opportunity for a DIRTcar Nationals win for the second year in a row. Stewart Friesen rallied late from his 10th starting spot to finish in fourth while Erick Rudolph came from seventh to complete the top five. Laubach was the fastest car on the night in group qualifying with a lap of 17.817. Heat wins were secured by Laubach, Billy Pauch, Billy Dunn and Dave Rauscher. Peter Britten and Steve Bernard won their respective consolation events. Tyler Dippel was fined $500 and placed on probation until the end of the 2016 Super DIRTcar Series season following an incident the previous night.